Dubbed sometimes as the political capital of Africa, Addis Ababa is a buzzing hub of economic, social and political activity and home to monuments of great collections which include but not limited to: Ethiopian National Museum which houses the fossilized skeleton of Dinkinesh, or Lucy, the Australopithecine discovered in the area in the 1970s, Ethnological Museum, Tiglachin Monument and the Holy Trinity Cathedral, which is home to the tombs of the Emperor Haile Selassie I and Empress Menen Asfaw, as well as other members of the Imperial Family. Located in the eastern part of Africa, Ethiopia is also known for its strong roots to Reggae and thus will forever remain at the heart of many reggae enthusiasts around the world. 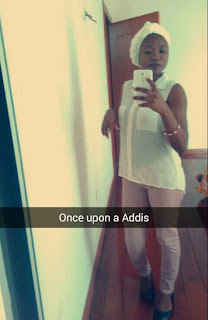 Alli Suliat, a graduate of Chemistry from one of Nigeria’s most prestigious university and an obsessive tourist recently journeyed Addis Ababa. 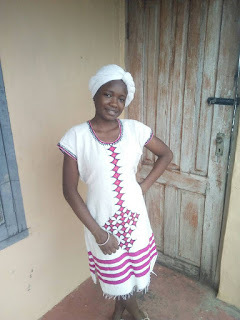 In this interview with Alli Abiola, she recounts her experience. Welcome back from Addis Ababa, what informed the tour in the first place? Did you travel alone or in company with a group? The tour was a treat from dad since I recently graduated from the university. It was more like I went there to relax and have some fun. I travelled with my dad and brother. They both live there, I was their guest then and it was the second visit. How will you describe the trip? The trip was awesome. I had a swell time and I learned a bit about their culture. How long were you there, and where did you stay? I spent three weeks in Ethiopia. I stayed in the capital city, Addis Ababa (which is not too far from Bole - where the airport is located). Tell us the most interesting place(s) you visited? I visited their national museum in Adidas Ababa University. I was fascinated to see the popular Haile Selassie's bedchamber and that of his wife too, at the museum. I also visited the oldest church on top of the hill (you could see the whole city from there) and their first empire's residence is also situated there; I mean the original house he lived in. At the museum, I saw Lucy's fossil and so many other things related to their ancestors, culture, and ways of life. What was the first thing that caught your attention in Ethiopia? The people, their skin colour. Having visited a number of African countries, I always had this mentality that everyone in Africa is black or dark in complexion. I was surprised. Not that they don't have dark skinned Ethiopians but not as dark as ours. Also, the AU building in Addis Ababa, Ethiopia caught my attention, it's magnificent, and the architectural design is on point (It was actually designed by a Nigerian, so I heard), I see the building from my bedroom window every day and the evening I passed by it, I was glued to the car window staring in awe. Are there similarities between Ethiopia and Nigeria? Yes, they are both African countries (big grin). Well! About the similarities, I can't say much, the two countries are quite distinct. Addis Ababa is also a bustling city like Lagos and so much development is still taking place there. I interacted with some locals and from what they said; I was able to deduce that most people come from other parts of the country to make ends meet there (Addis Ababa) which is quite similar to our Lagos. I don't know if this makes sense, but that's how similar they are to me. What particularly impressed you about Ethiopia(ns)? (Maybe because) Ethiopia wasn't colonized. Planning the trip, I thought I was going to an ancient country, however, on arrival, I was impressed with how far they had gone even though they still relish their culture and heritage so much. The country is still developing though, and they have excellent coffee (smiles). I was also impressed with the fact that even though the world is changing around them and so much is going on, they are still stuck on and respect their culture and heritage so much. They still use their own ancient calendar (Amharic) etc. They are mostly Orthodox Christians. I didn't come across any Pentecostal church or whatever, and this is their ancient way! Do you think there is anything spectacular about the local food and the music? Well, the most popular food there is Injeera (a staple flatbread) and they have varying sauces for it. They’ve got excellent coffee as well; I enjoyed all my coffee dates and I was always looking forward to the next (date). Their music is rich too, they have different music, based on the tribes (they have three major tribes and they include: Amhara, tigre, oromo) etc. They have a common cultural cloth which has different patterns, designs. I was opportune to visit the cultural market. They greet a lot there, you greet virtually every stranger you come across. They are nice people. They admire and respect foreigners a lot. How was the weather of the city you visited? Was it friendly? Yes, it was friendly! The temperature is always cooler, than Nigeria’s weather condition and not as sunny. Because of the altitude, I believe. Ethiopia is said to have strong roots to Reggae. How true is that? I can't say because I wasn't there for so long to know this and the locals I interacted with, the music I heard, isn't enough to support that fact. As a Nigerian, what are those thing(s) or idea(s) worth emulating from Ethiopia(n)s? Food is cheap there (smiles). Where I resided, electricity was 20 hours a day on the average, (I can't say about other parts of the country), but in the part of Nigeria where I reside, we can't boast of that. Their government is working over there; you will see signs of this in every corner of the city and from the interactions I made with the locals, they said their government is trying but you know Nigeria is really richer than Ethiopia. Are you saying we can import electricity from Ethiopia? (Laughs), Not in that context; though the Nigerian government and agencies should please work on this, it's a shame that our country even as rich as we are, I mean we are the African giants, we can't boast of stable electricity. It's a big shame. Comparing Ethiopia with Nigeria, their government is really working and the people are hardworking. The country is majorly into coffee export in Ethiopia compared to Nigeria's oil. Whenever I said I was from Nigeria to them it's like I am from the US or UK, they always wanted to talk to me, ask me about Nigeria. I couldn't divulge how messed our country is. Things are generally cheap in Ethiopia. How would you rate the reception of Ethiopians to foreigners, particularly, Nigerians? On a scale of 10, I will give Ethiopia 9. Indeed, they are so good at receiving foreigners,you will know this right from the plane, that is, the Ethiopian airline. How much about Nigeria do they know in Ethiopia? Interestingly, they know the good stuff basically. Some also know about the insurgency in the north- an Ethiopian actually asked me about it. (Smiles) On a particular day, I was in a public transport; a man got on the bus, he looked at me and said "you are not Ethiopian", I replied with a “Yes, I am a Nigerian”, his response was; "wow, Dangote's country!!!" He was amused. So they know quite a lot about us and are willing to know more. On another occasion, an Ethiopian said to me; "Nigeria is a powerful country, strong one." What would a first-time visitor find most striking about Ethiopia? The air! The ambiance is just different, the way they speak too; they speak a lot in their local language. The most popular one is Amharic, right from the airport; you will be hearing "Salam naesh." The air there is just different, the streets smell so spicy and you can spot coffee stalls or sellers at almost every corner. What do Salam naesh means? How would you assess their Technology industry over there, compared to Nigeria? You don't see many locals hooked on the internet in Ethiopia like Nigeria. Even from what I observed, it's like they are just starting out with regards to that. Although, most of them use smartphones, can’t be compared to Nigerians. From what I heard too, they have many remote areas in the country. Addis Ababa (maybe because it's the capital city) is the most developed part of the country, so definitely tech might be in shape there, but not other parts of the country; unlike Nigeria. What else don't we know about Alli Suliat? I love traveling a lot! I will tour more countries of the world. I am still within Africa, at the moment. Ghana, Togo, Benue republic and Ethiopia is gone, others to come!!! Then I will start touring Europe, the Americas, Insha Allah. On a Final note, if you could give an intending traveler a vital advice. What would that be? You should always wear a smile. You will get help real quick in some situations. Also, it's not every food seen on the streets; you should consume or eat, even though they are so cheap. Take caution so that your intestines wouldn't get clogged. We, tourists like things such – always eager to taste all delicacies. I would advise that you’d please always carry bottled water around too, their altitude there is quite different from ours here, and one gets tired easily without doing much. Water will help; I was also advised on this. I am still trying to understand this, maybe you should check up on it, though. Dad was always advising me to drink water and take lots of fruits there; one can easily get flu so as to prevent it. Maybe, because I am a foreigner. Stay healthy to enjoy your trip o! Ethiopia has lots of fine diners too; International cuisine etc. I even went to a Nigerian and Chinese restaurant. They have excellent meals even the Japanese as well. Cho! (In Ethiopian language, that would mean ‘Bye’).